It had been a couple of months now since our diva’s residency at Hail House. After the big event and her emotional fall-out after the review in the paper, she gave herself some time off from any big campaigns. There was Memorial Day weekend kicking off “Long June” all the way through the Fourth of July. Dinners on patios and rooftops complete with delicious bubbly drinks drew her attention slowly away from the full court press she had completed in the spring during the lead up to her residency. She hadn’t stopped practicing in the summer, but it had slowed to a somewhat residential speed. There wasn’t a YAP on her summer docket this year, but audition season took on an immediacy in her mind. This summer she had found her way back to her audition package. She scheduled some coachings and felt better about her new German aria than she had felt about German in some time. She also felt more prepared for the intimacy of the audition space. She didn’t fear the panel as much as she had in seasons previously. The Day 24 challenge on your journey is rededicate yourself to change. “I wanted to take a moment to introduce you with Aaron (cc’ed here.) He runs the ensemble in vita indiscussum that I was telling you about when we met at Hail House last spring. Anyway, he and I are working on a project together. They commissioned me for their upcoming season. We got to talking and I told him how much I enjoyed your residency in May. (Sorry, I could only come for the third night.) It was so cool. Plus, I think I mentioned to you that IVI does a lot of curatorial programming around mental health issues too. I’ve been deeply impressed with your artistry and passion, and it occurs to me that this commission might be the opportunity to collaborate with you that I’ve been keeping my eyes out for. Plus, Aaron said that they’d be really interested in collaborating with a singer. They don’t have anyone as part of their regular roster. Anyway, I know that you and Aaron have lots of things in common. Let me know if you’d be interested in something like this. I’ve already been composing the song cycle over the last year, but I think that it would work in your voice quite well. We could definitely talk about that. She finished reading the email and let out a little astonished laugh. Her stomach gave a flip-flop and she felt herself sweating and not from the heat outside. This was completely unexpected. She hadn’t really heard from very many music people after her residency so she had been letting it slide into her memory before she picked up the idea again. This was thrilling. Was she ready to commit to an important, new venture again? “Why the hell not?” she asked herself. Facing her fears of failure, or even the unknown, with compassion filled her thoughts. She was proud of herself for not quitting after she was bummed about the review. She wasn’t loud about it. She didn’t post about it on social media. She also didn’t go hard-charging into the next thing. This felt a lot more organic. She knew that she was going to say “yes” to this new opportunity. But, she would have to keep dealing with her fear. Avoiding the fear she felt was a sure fire path to overwhelm, she knew. But, she needed to practice sitting with the fear. She couldn’t continue to treat fear as a threat from which she needed to run away. This new opportunity had lots of possibilities in it. They can’t all be bad. She resolved to be kind to herself when she felt fear because that was a sign that she was going after her more audacious goals. To practice, she decided she would focus on naming exactly what the fear was that was showing up and then try to recognize it as a helpful suggestion she could put on her to-do list. 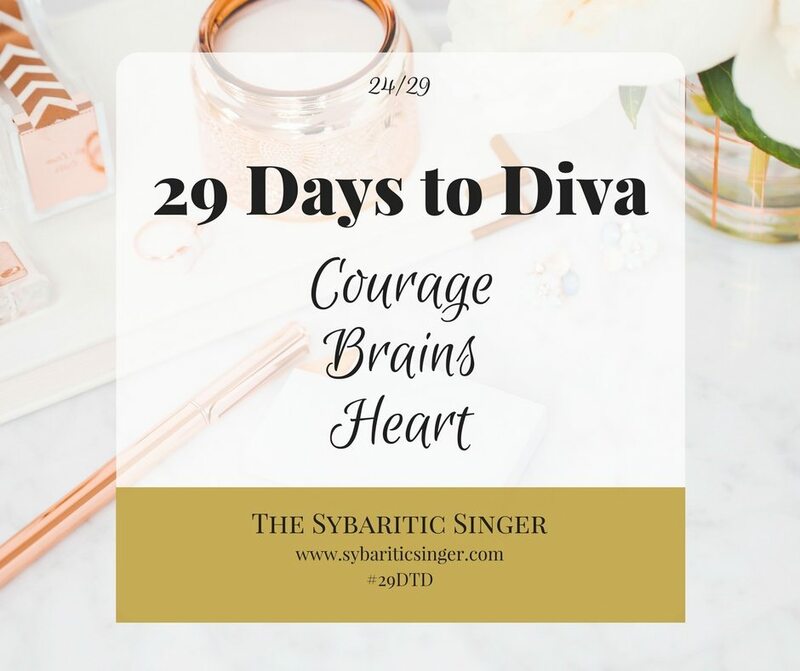 This was not a life or death situation, she admitted to herself, but sometimes our brains don’t always register the difference when fear decides to show up. Our diva grabbed a post-it note and scribbled, “courage, brains, heart” and stuck it on her bathroom mirror. She could do this.